Snapper are one of New Zealand’s most popular fishes, and are highly sought after – both recreationally and commercially. They are found around the shallow waters of the North Island, making them an ideal fishing target. The Kaipara Harbour, north of Auckland, is one of the largest harbours in the world. It is a large estuary, and supports fish, oysters, mussels and scallops. Seagrasses play an important role in these estuarine ecosystems. They provide a nursery habitat for fish, help to stabilise the sediment by trapping sand and mud around their roots, and transfer nutrients between the seabed and the ocean above it, as the grasses grow. Juvenile snapper live in the seagrass beds in the harbour, which offer lots of food and protection from predators. Recent research has proposed that these juveniles can actually smell the seagrasses in these harbours, and will choose to swim towards them. Unfortunately, since seagrasses are located in shallow coastal waters, they can be vulnerable to human activity. The Kaipara Harbour drains several rivers, which carry sediment and nutrients from riverbanks. These murky waters can limit the amount of light that reaches the plants – which means less photosynthesis, and a reduction in growth. And if the harbour becomes a nutrient rich soup of farm run-off, phytoplankton will bloom, algae will flourish and again more light will be blocked from these already light-starved sea-grasses. The Kaipara Harbour is especially important for juvenile snapper – it is estimated that over 95% of snapper on the west coast of the North Island grew up here. This study was done by analysing the ratios of trace elements in the otoliths (ear bones) of adult snapper, and comparing them to juvenile fish collected from different nursery habitats around New Zealand. This means that the western North Island snapper stocks are likely to be heavily reliant on the Kaipara Harbour – and proves how fragile these fish stocks may be. So what’s being done to clean-up this all-vital nursery ground? Since 2011, the Integrated Kaipara Harbour Management Group has been working with landowners to clean up their local river-ways through fencing and riparian planting – now over 15,000 trees have been planted. The multi-stakeholder group – made up of hapū of Ngāti Whātua , local and central government, crown research institutes, community and environmental groups such as Forest & Bird – runs regular ‘paddock to harbour’ workshops and meets regularly to discuss its milestones. 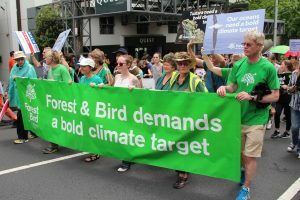 It has engaged conservation volunteers (www.conservationvolunteers.co.nz) to carry out mitigation and environmental initiatives at the flagship sites and recently several farmers have begun to establish nurseries in their back-sheds. It has also taken on a new type of flagship partner – a limestone quarry. As well as encouraging landowners to fence and plant their waterways, the group is looking to restore many of the long-lost wetlands in the area, so these can soak up and filter some of the water sliding down the now bare hillsides. The Kaipara Management Group know that the job is a big one – only 0.4% of freshwater ecosystems, 19.1% of forest ecosystems, 2% of dunelands and 5% of estuarine ecosystems remain in the Kaipara harbour catchment. And their goals are lofty. The group hopes to plant 2 million trees by 2015. And to even begin to eyeball these stratospheric targets they need to tap into something a little more nebulous: community spirit. At present, one of their biggest goals is to build some local pride to get the community to value this estuarine jewel, its extensive sea-grass meadows and these vital snapper nursery-grounds. Of course, carrots will be dangled along the way, but for such an ambitious project to succeed the locals need to own it. This occurred with the clean-up of the Raglan harbour – a project that was spearheaded by a forthright fisherman who simply wanted to catch more fish, so with good community backing this ambitious project is bound to thrive. With these diverse communities getting involved, and working towards the restoration of the Kaipara Harbour’s precious marine and coastal ecosystems, New Zealand’s favourite fish might just have a chance.